Rising like a phoenix out of The Windy City, Electric 5 is a freshly formed, classical crossover electric string quintet that performs unique and enchanting choreographed string renditions of some of the greatest Rock and Pop successes of all time. Through their highly innovative arrangements and masterful musicianship, Electric 5 is able to recreate the beauty and magic of every song they cover without the use of back-up tracks. Their genre-defying act includes vocals, and is capped by the virtuosic electric violin “wah-wah” pedal improvisation solos of the group’s founder, Adia, who is a winner of the 2014 Judges Selection for the Jimi Hendrix Experience Tour, and the 2013 Steve Vai Best In Shred competition. This newly minted, “easy on the eyes” quintet’s rendition of the infamous Gnarls Barkley song “Crazy” is their debut video and one not to be missed! Similar to 2 Cellos and Simply Three, Electric 5 flips the script on classic Pop and Rock music by throwing 5 female string players into the mix, creating an incredible, out-of-this-world music mosaic that will charm audiophiles near and far. Each a gifted soloist in her own right, these five superb musicians are all classically trained with advanced degrees from prestigious music schools, and have played for some of the Nation’s leading orchestras, including the Chicago Sinfonietta, the Illinois Philharmonic, the Colorado Symphony, the Fort Wayne Philharmonic and the Illinois Symphony. 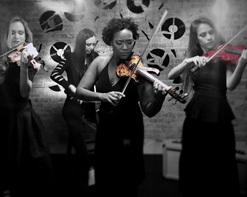 These ladies have gone above and beyond the conventions and constraints of classical music to become some of Chicago’s most versatile and accomplished string performers, having played alongside music legends like Sarah McLachlan, Yo-Yo Ma, Midori, Josh Groban, Sarah Chang, Patti LaBelle, Lupe Fiasco and Itzhak Perlman. The video for “Crazy” tells the story of a woman scorned taking her revenge on her partner. The video opens with penetrating clips of Adia sharpening a knife after finding out that her partner was with another woman. Interjecting some diegetic sound with a record player needle to begin the spiraling of Adia’s demise into “crazy,” the haunting layers of the 5 string melodies and harmonies prove to be the perfect background for this cinematographic masterpiece. Adia calmly prepares for her retaliation while clips of the three (the bass player wasn’t added until after the shoot) other incredibly talented string players show off their immense performance skills. We are very honored and thrilled to be working with such a standout talent like Electric 5 and are excited to bring you their new video of Gnarls Barkley’s “Crazy.” For more information on Electric 5 please contact Andy Gesner and the HIP Video Promo team at (732)-613-1779 or email us at info@HIPVideoPromo.com. You can also visit www.Electric-5.com for more info on Electric 5.